Short-term dietary protein restriction reduces circulating TGs independently of total caloric intake via effects on VLDL-TG levels. B6D2F1 mice were fed the indicated complete (C, 18% protein content) or protein-free (PF, protein replaced with isocaloric sucrose) diet for 1 week prior to analysis. (A) Serum triglyceride (TG) concentrations in mice fed the indicated diet on an ad libitum basis (AL) or restricted daily (CR) by 50% (n = 5/group; 2-way ANOVA with Sidak post-hoc test between the indicated groups. (B) Serum TG in mice on the indicated diet (n = 4–5/group; 2-tailed Student’s t test between diets within fed or fasted state). 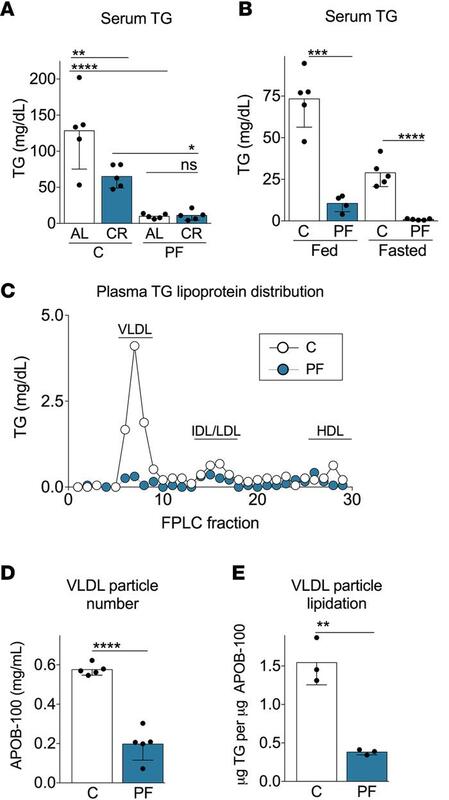 (C) TG levels in FPLC fractions from pooled plasma samples (n = 5/group; VLDL, very low–density lipoprotein; IDL, intermediate-density lipoprotein; LDL, low-density lipoprotein; HDL, high-density lipoprotein). (D) Serum APOB-100 concentration representative of circulating VLDL particle number (n = 5/group; 2-tailed Student’s t test). (E) TG content of purified VLDL particles expressed per unit APOB-100, indicative of VLDL particle lipidation (n = 3/group; 2-tailed Student’s t test). Data expressed as mean ± SD; *P < 0.05; **P < 0.01; ***P < 0.001; ****P < 0.0001.